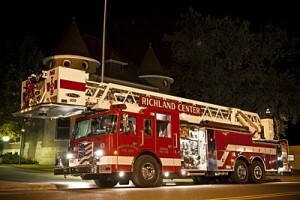 The Richland Fire Department is a paid on call volunteer department comprised of 45 members including seven line officers and the chief. Our department protects the City of Richland Center, WI, one incorporated village, and all or parts of twelve of Richland Counties sixteen townships. The area protected by the RCFD comprises of 310 square miles, with all of our fire equipment being housed in a single station in the city of Richland Center, WI, the county seat for Richland County. We travel to the county line in two different directions from our station. This makes our department one of the largest first response service areas in the entire state protected by a fire department either volunteer or full time in the state of Wisconsin.